And right at this very moment, for maybe the first time ever, I feel like I’m in my own story. When Kate over at Kate Olson Reads tells me multiple times to read a book, I read it. She’s never steered me wrong. When she suggested The Summer of Jordi Perez by Amy Spalding after seeing how much I loved Dumplin’ and To Be Honest, I moved it to the top of my reading pile. And as usual, Kate was right. This is a fun YA book with a whole lot of heart, and if you’re looking for a feel-good book to end the summer with, this fits the bill! Abby Ives is 17, gay, plus-sized, and obsessed with fashion. Her parents are less than supportive. But when she meets fellow fashion intern Jordi Perez over the summer (and fully falls for her), Abby has to balance romance with competition, and who she wants to be going forward. Let me say this first: I want to be friends with Abby. There’s no wordsmithy way to put it: she’s a damn cool girl, and I wish I knew her in real life! Now. This is a very cute, contemporary YA romance that is a really fun book to read. I don’t have a lot of experience reading LGBTQ YA, but thanks to the Diverse Books Club and Kate Olson, I’ve found some good ones. (There’s also just not a ton out there, and definitely not many in the mainstream lit world. Lesbian romance seems even harder to find than male romance.) This one is fantastic. So, so good. I rooted for Abby and Jordi the whole time, and I love that the author doesn’t make a big deal out of the actual gay romance-it’s just romance and normal teen angst. This is how YA lit should always be written. Because it is normal. The only thing I wanted more of was Abby’s friendships. We’re kind of dropped into the middle of Abby and Maliah’s (her best friend) friendship, and I would have loved to see more of their story because the characters were so good! She also befriends a boy named Jax who seemed to have some family issues of his own, but was only hinted at. I love background stories on side characters! 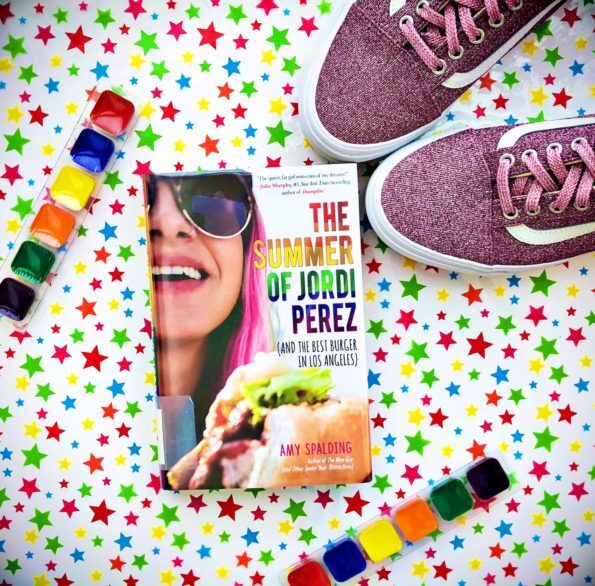 If you’re looking for a good YA book, or a fun romance, and also want to diversify your reading a bit, I highly recommend The Summer of Jordi Perez !! Thank you to the Kid Lit Exchange network for the review copy of this book! All opinions are my own! News flash: fat isn’t a bad word, Mom. . . . I have blue eyes. I have blonde hair. I’m fat. Literally nothing about my life is changed because that word is associated with my physical appearance. Y’all, YA authors have been hitting it out of the park lately with body-positive, non-traditional main characters lately. 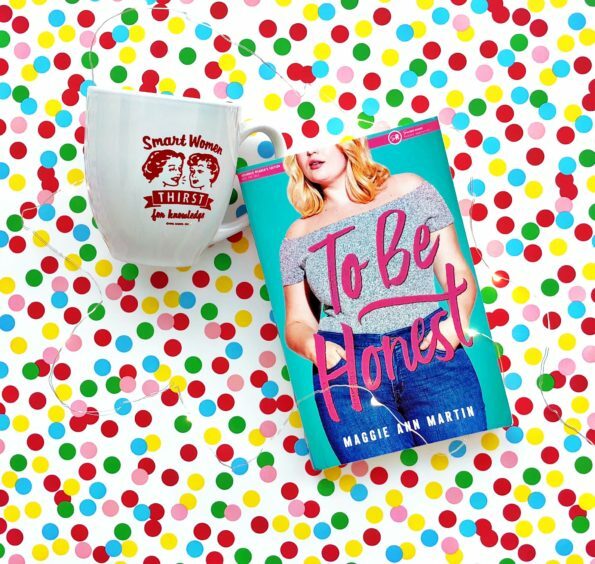 To Be Honest by Maggie Ann Martin is no exception. A beautiful, smart, funny, fat main character? Yes, please!!! (“Newsflash: Fat isn’t a bad word.”) At the risk of sounding preachy, I just want to say how important it is that these books exist, and how much I wish they had existed when I was growing up. Books like this aren’t advocating for kids to be unhealthy (an argument I have heard before, or I wouldn’t be mentioning it). They are advocating for kids (mostly girls, because there’s such a huge diet culture aimed directly at females) to love who they are, their size, and what they look like RIGHT NOW. Not later. Not, “once I’ve done such and such.” To love themselves right here and right now. Fat isn’t a bad word, and it’s also not a determining factor in personality, brains, or success. I cannot stress how important this is, and I think everyone, young and old and older, should be reading and embracing these books and themselves. Alright. On to the review. Savannah (Savvy) is not looking forward to the next year. Her sister and best friend just left for her first year at college, and Savvy is stuck at home with her weight-loss-show contestant mom. In addition to losing an unhealthy amount of weight on the show, she is now obsessed with remaining thin, eating the least amount of food possible, and dragging Savvy into that lifestyle. Meanwhile, Savvy has a new friend/crush in George, the new kid at school. Between her mom’s concerning behavior, her love life, and trying to be a normal teenager in the process, Savvy is juggling quite a bit. 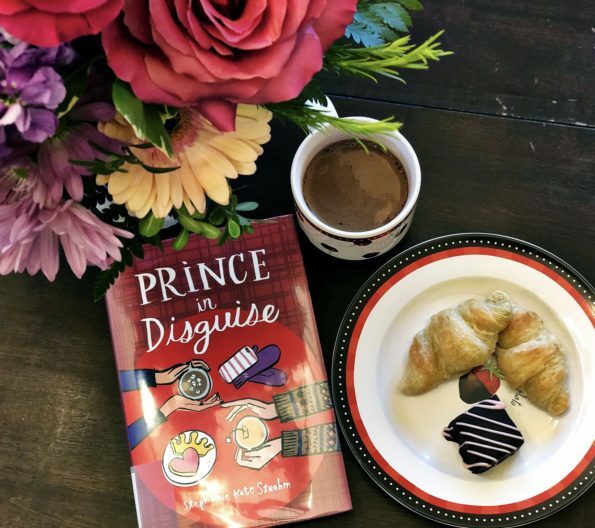 The story is about Savvy finding her own happiness amidst insecurities, her mom’s unhappiness, and figuring out who she really is as a person. This book is wonderful. Wonderful! On the surface it’s a YA romance, but the story goes much deeper than that, in a way that’s easy for younger readers to relate to. I loved seeing the development and breakdown of the mother/daughter relationship (and the not so thinly veiled sendup of The Biggest Loser, an extremely harmful show) and how realistically Martin portrays the slow healing of a damaged maternal relationship. She really stresses the importance of how our kids see us versus how we see ourselves, which rarely matches up. Before the reality show, Savvy saw her mother as strong and beautiful, and all she wants is for her mom to look at herself through that lens. (Something we could all stand to do.) Savvy also love the way she looks. She does not apologize for being a certain size, and she displays only a few normal insecurities that anyone might have. As for the romance . . . it’s a sweet plot, and Martin handled it perfectly for middle grade and up readers. I love that looks aren’t ignored (there’s no way for looks not to be involved in the beginning of relationships, especially in a teen YA romance novel), but aren’t the main focus, either. It’s about how Savvy and George support each other and how they make each other feel. Being cute is just the YA icing on top. My only complaint about To Be Honest is that I wish it was longer! There were some wonderful sub-plots that would have been even better if they’d had a few more pages devoted to them, and Savvy’s relationships with her mom and dad would have benefitted from a few more in-depth scenes. However, this book is perfect as a middle school and teen book and as a body-positive story (more fat girls in lead roles with the focus not being on their weight, please). I would truly recommend it to anyone ages 11 and up. You need it in your life!! This would be a great companion read with Julie Murphy’s Dumplin’. (Read my review of that HERE.) I don’t often make read-alike comparisons, because that’s too much pressure to place on a book! The writing styles of these two books are different, but they both send the same message of being with who you are, not just how you look. I read a lot of Young Adult literature. I love it, and some of it is more well-written than adult books. 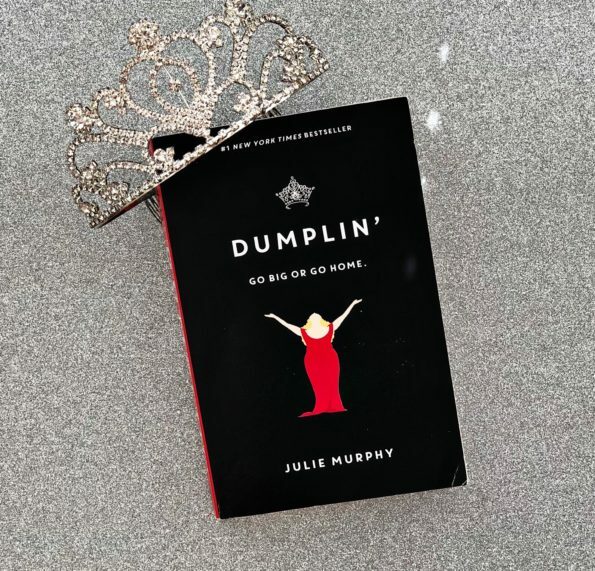 I have never read one that is so body positive, with a character that not only has an amazing attitude but isn’t afraid to stand up for herself, as Dumplin’ by Julie Murphy. Murphy is now going to be an auto-buy author for me, and I ordered all of her books after reading this. Dumplin’ is what I want all YA books to be: funny, insightful, honest, and entertaining. Willowdean Dickson (nicknamed Dumplin’ by her mother) is the daughter of a former beauty queen and pageant winner. She is also fat, outspoken, and proud. She’s happy with her body and her life (for the most part), and she goes through life with her best friend, Ellen. When a new boy named Bo starts working at the same place Willowdean works, she is immediately attracted to him. Surprising to her? He likes her back. For the first time, Will doesn’t feel so confident, and wonders why he would like her. To gain back her confidence and prove to herself (and everyone else . . . and her mom) that she is worthy of everything good in her life, she decides to enter the Miss Clover City beauty pageant. Everyone is shocked that someone who is not a typical pageant contestant would even enter, but Will inspires a movement that changes the view of everyone in the town. And, more importantly, reasserts her faith in herself. The plot in Dumplin’ is so good, but it’s the characters who I really love. Willowdean is so real. Her characters doesn’t feel forced at all. Everything she says and every action she takes feels like exactly the right thing for her character. All I really want to do is find the adult version of her and be friends with her. I love that she doesn’t shrink into the background and basically says, “screw you” to all the jerks in the novel by doing the least expected think of all: entering the pageant. She does it unapologetically and not as a joke or with the goal of making a huge deal about it: she does it for herself. And we can just talk about body positivity for a minute or ten? In my experience, there are very few novels that portray actual overweight characters in a positive way. They are usually quiet or mean, and are always side characters. Here we have an overweight main character who is proud of herself, happy with herself, and doesn’t spend the majority of the novel lamenting her size. Yes, she’s real, and while she is comfortable and confident in her body, she’s also ashamed at times. Everyone can relate to that feeling, no matter what size they are. But she doesn’t let it get in the way and doesn’t spend a lot of time focusing on it. This is all about confidence, and how much we can actually accomplish in our lives if we stop getting in our damn ways with negative thoughts. I am here. For. It. If you love YA, or if you’re not sure you love YA, or if you have a middle grade to high schooler in your house, please get Dumplin’ (and the sequel, Puddin’ , which should be arriving at my house soon) and read it. Have your kids read it. It’s entertaining and fun, but it’s also an important commentary on how girls are “supposed” to see themselves in public, and how they should see themselves. How we all should see each other: as human beings capable of accomplishing anything we want to do. Size is not important here, just heart. Love is an enchantress—devious and wild. It sneaks up behind you, soft and gentle and quiet, just before it slits your throat. Today happens to be the last day of Summer Solstice, which plays a huge role in this book! 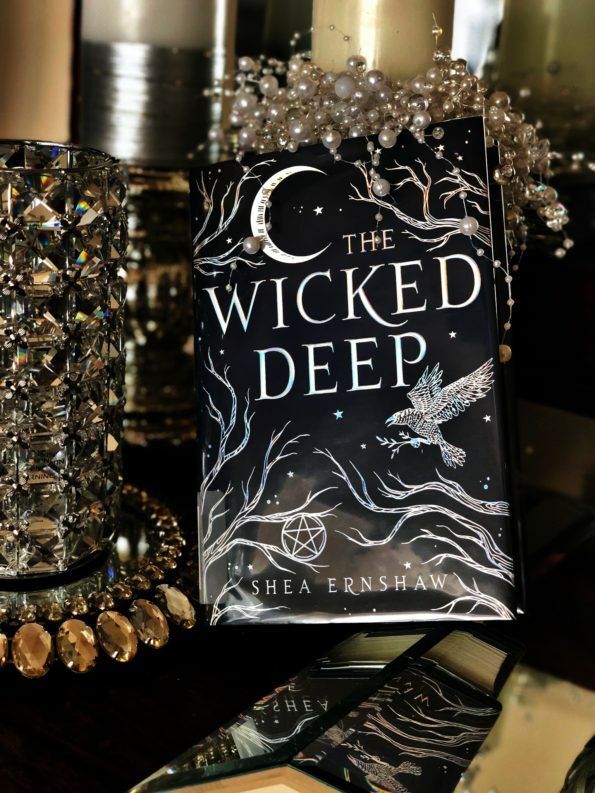 I want to stand on a rooftop somewhere (but like, a nice rooftop with a garden, not a dirty one filled with A/C units) and yell my undying love for The Wicked Deep by Shea Ernshaw. It’s not quite magical realism, and it’s not quite fantasy, but it’s a fantastic combination of the two, and I will be the first in line for Ernshaw’s next book. Two hundred years ago, the three Swan sisters were sentenced to death by drowning for being witches. Ever since, the town of Sparrow has been cursed. Every summer during the Summer Solstice, Swan season begins. The sisters return from the sea, take over the bodies of three girls in the town, and lure boys to their deaths in the water. Penny Talbot has ignored Swan season and the boys who die every year. But when Bo Carter shows up, Penny tries to protect him from the danger he’s unaware surrounds the town. Penny must choose whether to save Bo or herself, and whether she can trust Bo with the deepest of secrets. This book is immediately addicting. The storyline is mysterious, fast-paced, and very well written. I won’t compare anyone to the queen of magical realism, Alice Hoffman, but there are some very strong Practical Magic vibes here. (In a wonderful way, not in a copycat way at all.) The entire book is unique, and quite different from other witchy novels that I’ve read before in that it balances a fine line between mystery, magic, romance, and paranormal activity. I don’t know how Ernshaw did it, but she’s written a pretty perfect book.